No #PumpkinSpice on the #Avalon? There goes the future. The #SpaceLeap scene is absolutely breathtaking. Jim trips on a bottle...it’s been the downfall of many men. Most amazing swimming pool in the universe. Holding hands among the stars...best first date ever. “You’re the most beautiful woman I’ve ever seen.” Every man left on Earth agrees with you, Jim. 612 physical disorders. Oh Frack! The #Avalon is supposed to be #Meteor proof. Yeah, and the #Titanic was supposed to be iceberg proof. Those last ten minutes were heart-stopping. Final analysis: a #Titanic meets #WALLE lost in space yarn with scintillating central performances. The only drawback here is its derivative plot. Rating: 3 1/2 out of 4. #JenniferLawrence and #ChrisPratt have tremendous chemistry in this space survival story. Freebie: the 3 dits, 3 dahs and 3 dits on the poster is #MorseCode for #SOS. What if a man was accidentally awakened from a suspended animation nap ninety years earlier than planned? What if that man, the only conscious person aboard a gigantic spaceship headed for a distant planet, went bat guano crazy from being alone all the time? What if the man watched the video profiles of the 5,000 passengers on the ship and fell in love with one of the women? And what if that man, in the throes of loneliness and boredom, decided to rouse that sleeping beauty from her pre-programmed slumber? Such is the set up for the new sci-fi/romance movie, Passengers. Starring Jennifer Lawrence and Chris Pratt as star-crossed lovers who must negotiate the bitter realities of premature reanimation, the film is a master course in male/female relational dynamics in survival situations. The two stars have tremendous screen chemistry and nearly carry the entire movie by themselves—nearly. Michael Sheen and Laurence Fishburne play side characters who offer stellar support to the central couple, providing them with much needed advice and experience…and bridge access. There really aren’t enough superlatives to describe Lawrence and Pratt’s performances, so I’ll move on to an area of the movie I can critique. As is the case with many movies these days, the writing here is a mixed bag. Screenwriter Jon Spaihts is exceedingly adroit at evincing character motivations and habits and has skillfully infused the film with a tremendous amount of humanity despite its sterile, mechanical trappings. There’s a firm grasp of human relationships in the movie and the characterizations are flawless down to the most infinitesimal nuance. The romance subplot is sweet without being saccharine—the scenes where Aurora (Lawrence) and Jim (Pratt) have their first breakfast and first date are real gems. Commentary on class structure is cleverly woven into the narrative, like when we see Jim’s standard breakfast placed alongside Aurora’s Gold Star breakfast. The fact that Jim is an engineer and Aurora is a writer who comes from a family with means and status also addresses the inequities of humanity’s current caste system. Arthur (Sheen), the robot bartender, dispenses many keen observations on the human condition along with clever quips which add the appropriate amount of humor to this mostly serious film. Whereas Arthur brings the comic relief, Gus Mancuso’s (Fishburne) tragic sidebar furnishes the film with poignant pathos. The scenes where Aurora gives Jim the silent treatment are deftly crafted by Spaihts and expertly acted by Lawrence, who brings these scenes to life with startling realism (as any man who’s ever been spurned by a woman can attest). The prospect of dying alone in space versus the ethical dilemma over reviving a potential companion (which will consign her to a life of isolation) is the crux of the film and the implications of Jim’s fateful choice have profound ramifications on the entire story. One of the movie’s subtly stated motifs suggests that when our life’s aspirations go unrealized it’s how we choose to cope with our Plan B existence that defines us as individuals. Ultimately, Aurora (an overdetermined sci-fi name?) gets to write an exclusive, historic story, but it isn’t the one she had originally envisioned. Sadly, powerful takeaways like this one are overshadowed by contrived crises (like the escalating calamities that comprise the film’s conclusion), plot inconsistencies (Jim can browse personal personnel files and borrow a space suit, but is denied access to the bridge and can’t order a decent breakfast) and the movie’s Achilles’ heel…derivative storytelling. Aside from its “Adam and Eve in Space” premise, Passengers weaves elements from many other movies into its narrative tapestry. The most obvious thematic antecedent to this film is Titanic (1997). Both stories feature an upper class woman and a lower class man who fall in love on their way to a new world, but their ship encounters a dangerous obstacle along the way which threatens their survival. The obstruction in Titanic is an iceberg; here it’s an asteroid field. Perhaps the biggest source of inspiration for this film is WALL-E (2008). 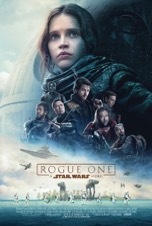 Both films feature long-range, resort style space vessels (with similar names—Axiom in WALL-E and Avalon here) which are conveying humans to a new planet since Earth is in a state of decay. These movies also employ an antagonistic autopilot which serves as a hindrance to our heroes. Additionally, Jim’s thrilling leap into space is reminiscent of WALL-E’s frolic among the stars. The final point of comparison between these films is that their scores have a similar style, which is fitting since the composer for both films is Thomas Newman. 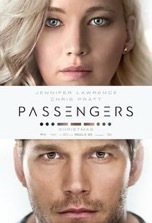 In addition to its pastiche plot, Passengers has an overwrought resolution, which is merely a series of near-death scrapes designed to produce a heart-pounding climax. This gimmicky ending is unnecessarily commercial and is incongruous with the rest of the film, which is essentially a big budget art film. A more contemplative denouement was in order here—one where we meet Jim and Aurora’s progeny and where we hear Aurora reading an excerpt from her book in a V.O. narration as the Avalon arrives at Homestead II. This emotionally complex and thought-provoking yarn deserved that kind of powerhouse finale—the extant epilogue is pat and merely satisfactory. Final thought: have you ever seen a more breathtaking pool? Or swimmer? “I don’t like being followed.” Yep, that’s daddy’s little girl. “I don’t like being followed.” Hmm. Seems to me I’ve heard that before. Bad guy gets hosed by Danika. “It means we’re dead already.” Daddy/Daughter code. Final analysis: a solid follow-up to the first film with some new characters and challenges. Rating: 3 out of 4. Drags at times, but the action scenes are well executed. Cruise keeps cruising. Based on Lee Child’s novel series, the first Jack Reacher (2012) movie introduced audiences to the title character, an anti-establishment, off-the-grid, ex-military drifter whose MO is cracking skulls while defending the little guy from evildoers. 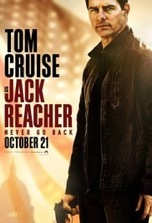 The follow-up film, Jack Reacher: Never Go Back, is a diverting, if not life-altering, sequel that finds Reacher (Tom Cruise) on the run from the military he once served as well as from his past; one of his former conquests had a daughter and is claiming that he’s the father…fourteen years after the supposed deed. To a former Special Forces lone wolf like Reacher, outrunning the MPs is a far less daunting challenge than raising a teenager. Fortunately, he gets some significant support in dealing with his alleged daughter, Samantha Dayton (Danika Yarosh), from a falsely accused Army officer, Major Susan Turner (Cobie Smulders). Together, Reacher, Turner and Dayton try to stay one step ahead of their pursuers while attempting to uncover an illegal arms racket inside the military, which will exonerate Turner. The story’s climax features a protracted chase sequence through the crowded streets of New Orleans during Mardi Gras—an action set piece that’s been done to death by now but somehow still manages to entertain. The scenes where Reacher says goodbye to his new-found friends are touching without being overly schmaltzy, which is consistent with Reacher’s laconic persona. The movie closes with Reacher thumbing a ride on the side of a highway—moving on to his next adventure like an Old West cowboy heading off into the sunset. Aside from some new characters and a few new scenarios, there really isn’t anything here that wasn’t in the previous movie. That’s not necessarily a bad thing for fans of the first film who just wanted more of the same in the sequel, but those seeking something other than just a reheated story may find this film wanting in the creative department. On the plus side, the acting is solid across the board: Smulders’ pluck is a plus as is Yorosh’s naïve self-assuredness. Cruise is satisfactory in the title role but doesn’t bring anything extra to the part this time, he just hits his marks and delivers his lines…and runs. Running has become a staple of every Cruise film; partly because he’s good at it and partly because a certain segment of his fan base really enjoys it. Here, Cruise is joined by the svelte Smulders on a few of his mad dashes—just to provide equal opportunity for ogling spectators. Although there are a few witty one-liners in the film, like Reacher’s pre-clobber comment about a thug’s barber, the proceedings are mostly serious and could’ve used more humor to counterbalance the dramatic and action beats. The fight sequences, coordinated by director Edward Zwick, are top-notch, yet feel like a retread of the multi-assailant melees seen in the prior movie. Even though Reacher 2 is an adequate sequel, has it done enough to extend the franchise into a trilogy? And if so, will audiences even show up for a third installment, or have they already decided to Never Go Back?